Do you need to maximize your work time with your coworkers? Would you like to know more about what Google has to offer? After reading about all the options in Google Apps for Work, I realized that this is what my college, Oakland University, utilizes, and what I have been using during my years as a student. Which explains why I am very efficiently able to work with coworkers and classmates to get our desired work done, on time for work and school. 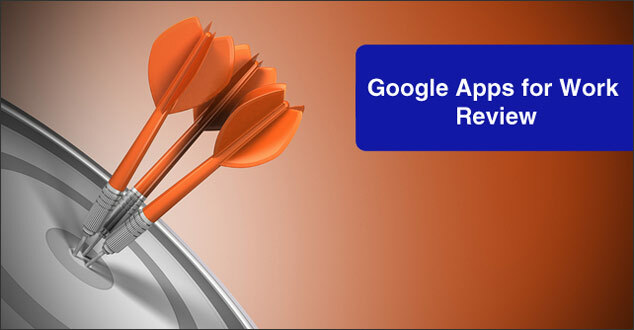 In this review, I will be covering the features of Google Apps for Work divided into sub-categories. Please check out the Communication, Store, Collaborate, and Manage sections for more information about Google Apps for Work. With Gmail, you can get a custom email that is professional for your business that helps build trust with your customers. Within your email you can create group mailing lists as your company needs them. Even without Internet connection, you can access Gmail so you can read and draft messages to send when you are back online, to be productive offline. Hangouts allow you to meet face to face with your coworkers and customers through HD video, voice or even text. Using Google Hangouts, you can save money and time lost during traveling, but still get that priceless face to face contact. Hold HD meeting for your entire team. Hangouts allows 15 users and automatically focuses on the person who is currently speaking and puts them on the big screen. Also with advanced technology, Hangouts is able to filter out background noise. Plus, Hangouts are accessible anywhere on any device. With a built-in screen sharing feature, sharing ideas to the other side of the conversation is easy. Not only that but with the ability to chat back and forth, makes it seem like everyone is in the same room. With a calendar that is sharable with co-workers, you can maximize your time doing the important tasks instead of planning to do the important tasks. Scheduling meetings is made simpler with the ability to layer your coworker’s calendars with your own to determine the best fit time for everyone. You can share your calendar so individuals can see the whole calendar or if you are just free. Google+ is as Google likes to put it “a social network designed for business.” You can connect with your coworkers and customers easily. Google+ allows you to share your thoughts with the entire community or just within your organization. You are able to gain insight to what your customers and coworkers are thinking about. Filter your connections to fit your needs, and organize them how you see fit, so you can always find things that are relevant to you and your ideas. Google Drive lets you store all your work in one place, that secure. You can access your work whenever you need to from wherever across all your devices. You can get as much storage as you need with 30GB of storage per user shared across Drive and Gmail. But if you run out, you can purchase Google’s unlimited storage plan for $10 per user per month. Docs allows you and coworkers to create and edit documents in Google. You can collaborate and work all at the same time with changes saving automatically. Communicate with the built in chat and add comments to ask questions all in the same document. Upload your document from your computer to make it instantly editable like Microsoft Word and PDF files. Make a change and decide you don’t like it? No problem, Docs offers unlimited revision history which allows you as the user to track changes that are made to your documents and undo anything you’re not a fan of. Google Sheets is an online version of spreadsheets, which allows you the user to calculate data, with a big smile on their face by using powerful functions and formulas in spreadsheets. Create forms and surveys for everyone at no additional cost, you can gather everything in a spreadsheet and analyze data right in. Slides let you create “slides” just like you would see in Microsoft PowerPoint and work on them at the same time and because everything is going mobile, you can even work on them on a mobile device, or any device. Since you are collaborating on your Slides, you can actually talk to people through the chat feature to discuss what should go next on the slide. Google even lets you create simple websites for our teams, without writing the code. To create a Site, it’s as simple as writing a doc through an intuitive editor. As an Admin, you would be given the power to manage Google Apps for your organization by adding users, managing devices, and setting up the security settings so everything stays safe. If you have any questions regarding your Admin account, you can rely on Google’s 24/7 support and reliability. With only an additional $5 per user per month, you can add archiving and eDiscovery to Google Apps. This is useful to control how long your email messages are available. With a Google-powered search, you can find things in the vault quickly. All of the amazing features mentioned above are available on Google Apps for just $5 per user per month with limited storage. However, for unlimited storage, it’s only $10 per user per month. If you honestly think about how much Google Apps could do for your business, I think it’s worth a shot to investigate further. Check out Google Apps online and see if it’s the right fit. Does your business currently use Google Apps for Work? If so, do you have a favorite feature? If not, would you and your business be interested in trying it out? Chloe you are continually striving to make my job easier! I didn’t know that Google had so many options. I’m looking forward to your next article! It is great to hear that you found Chloe’s post helpful! I will make sure she sees your cooment. You really write well, very useful article and very nice blog too. Keep writing such informative articles and thanks for the information. I’m so glad to hear that you like Chloe’s Google App for Work review! I will pass your comment onto to her.